"Veni, Vidi, Vici" - those immortal words of Julius Caesar were the inspiration for the V3 model line. It was the model that established Kizer as a force to be reckoned with in today's knife market, and now we're happy to see a Vanguard version with a more affordable price tag. The Vanguard V3403A1 V3 Vigor folding knife by Kizer Cutlery packs a lot of quality into a very compact package. It features a 3" VG10 blade with a drop point shape and brushed satin finish. 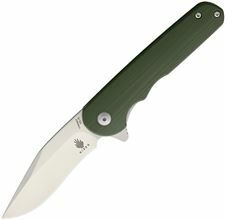 The action is quick, snappy and authoritative, as with all Kizer knives. The dual thumb studs provide ample purchase and there is a large lanyard hole that will easily house 550 paracord. 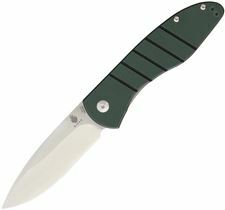 The smooth OD green G10 handle has a slim profile for easy carry and is extremely ergonomic. It features a reversible spring pocket clip, stainless steel liners and is sure to become an everyday carry favorite in no time since it's priced well below its design and quality levels.